Turns out that the Ann Arbor-based company rolled out this new marketing campaign in April of this year. The idea behind it is that they have found some topping combinations that are so perfect that they won’t allow customers to screw them up by altering them. 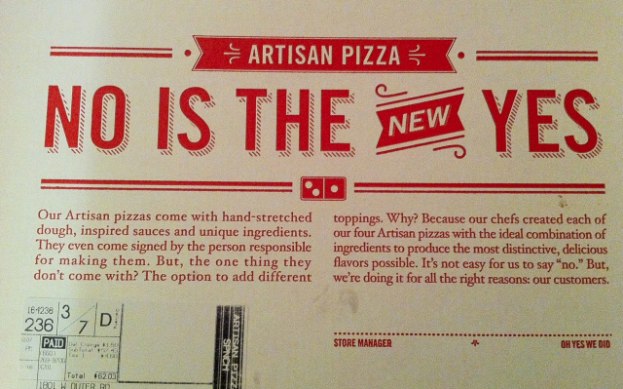 In other words, if customers ask to customize the toppings on these “Artisan Pizzas”, they will be told “no”. Apparently Domino’s, currently owned by Bain Capital and owned founded by the very conservative Tom Monaghan, founder of the far-right Thomas More Law Center and other Catholic organizations aimed at promoting his religious views throughout society, doesn’t have any women on their marketing team. The ad agency Domino's used to create the ad is called the CPB Group. You can call 305-859-2070, ask to speak to Tammy Degrasse-Cabrera and complain. You can also complain to Dominos via email. Wow, a Catholic Dominionist, Bain Capital, and women against the tribe of women. We MARCH!! !